Before she attended the prestigious French cooking school École de Cuisine La Varenne, Virginia Willis had been shelling butterbeans alongside her mother and grandmother in her Georgia family kitchen ever since she could stand on a stool. These divergent influences inform Willis' passionate homage to the cooking of the South. From simple starters and slaws to generous entrées and desserts, Willis makes down-home cooking refined and haute cuisine friendly, with recipes like Vidalia Onion Soup with Bacon Flan, Pulled Pork Sandwiches with Mama's Barbecue Sauce, and Hot Vanilla Soufflés with Vanilla Ice Cream. 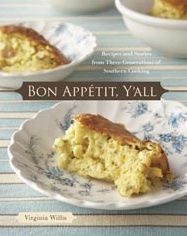 Brimming with stories, tips, techniques, and gorgeous photographs, Bon Appétit, Y'all seamlessly blends Willis' Southern and French roots into a memorable and thoroughly modern cookbook.